Tribology, the science of friction, wear and lubrication, is one of the cornerstones of engineering’s quest for efficiency and conservation of resources. 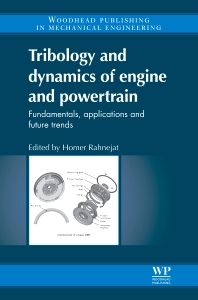 Tribology and dynamics of engine and powertrain: fundamentals, applications and future trends provides an authoritative and comprehensive overview of the disciplines of dynamics and tribology using a multi-physics and multi-scale approach to improve automotive engine and powertrain technology. Part one reviews the fundamental aspects of the physics of motion, particularly the multi-body approach to multi-physics, multi-scale problem solving in tribology. Fundamental issues in tribology are then described in detail,from surface phenomena in thin-film tribology, to impact dynamics, fluid film and elastohydrodynamic lubrication means of measurement and evaluation. These chapters provide an understanding of the theoretical foundation for Part II which includes many aspects of the physics of motion at a multitude of interaction scales from large displacement dynamics to noise and vibration tribology, all of which affect engines and powertrains. Many chapters are contributed by well-established practitioners disseminating their valuable knowledge and expertise on specific engine and powertrain sub-systems. These include overviews of engine and powertrain issues, engine bearings, piston systems, valve trains, transmission and many aspects of drivetrain systems. The final part of the book considers the emerging areas of microengines and gears as well as nano-scale surface engineering. With its distinguished editor and international team of academic and industry contributors, Tribology and dynamics of engine and powertrain is a standard work for automotive engineers and all those researching NVH and tribological issues in engineering. Part 1 Introduction to multi-physics and tribology within the multi-physics environment: An introduction to the multi-physics mutli-scale approach. Section 1.1 Fundamentals of tribology and dynamics: Mechanism and laws of friction and wear; Surface phenomena in thin-film tribology; Fundamentals of impact dynamics of semi-infinite and layered solids; Fluid film lubrication; Elastohydrodynamic lubrication; Measurement of contact pressure under elastohydrodynamic lubrication conditions. Part 2 Engine and powertrain technologies and applications: Section 2.1 Overview: Tribological considerations in internal combustion engines; Predictive methods for tribological performance in internal combustion (IC) engines. Section 2.2 Tribology of piston systems: Fundamentals of lubrication and friction of piston ring contact; Measurement techniques for piston ring tribology; An ultrasonic approach for the measurement of oil films in the piston zone; Surface texturing for in-cylinder friction reduction; Optimised textured surfaces with application in piston-ring/cylinder liner contact; Transient thermo-elastohydrohynamics of rough piston ring conjunction. Section 2.3 Valve train systems: A multi-scale approach to analysis of valve train systems. Section 2.4 Engine bearings: Fundamentals of hydrodynamic journal bearings: An analytical approach; Practical tribological issues in big-end bearings; Tribology of big-end bearings. Section 2.5 Drivetrain systems: An introduction to noise and vibration issues in the automotive drivetrain and the role of tribology; Friction lining characteristics and the clutch take-up judder phenomenon with manual transmission; Contact mechanics of tyre–road interactions and its role in vehicle shuffle; Tribology of differentials and traction control devices; Non-linear dynamics of gear meshing and vibro-impact phenomenon; Rattle and clatter noise in powertrains – automotive transmissions; Various forms of transmission rattle in automotive powertrains; Dual mass flywheel (DMF) as a means of attenuating rattle; Multi-physics approach for analysis of transmission rattle; High-energy impact-induced phenomena in driveline clonk; Tribo-elasto-multi-body dynamics of a single cylinder engine under fired condition. Part 3 Micro-systems and nano-conjunctions: Microengines and gears; Small-scale surface engineering problems. Homer Rahnejat is Professor of Dynamics at the Wolfson School of Mechanical and Manufacturing Engineering, Loughborough University, UK. Professor Rahnejat has an international reputation for his research in integrated multi-body dynamics and tribology across the physics of scale, particularly in to automotive engineering. I got good information what am expecting regarding secret of wear and tear reduction technology in in now Automotive Vehicles though tribological Aspects.